THPBlog: Timber Products Company to log near Kangaroo Lake Recreation Area. Timber Products Company to log near Kangaroo Lake Recreation Area. This THP is about 8 miles east of Callahan CA and about 16 miles NW of Mt Shasta at an elevation of 3,400 to 6,480 feet. 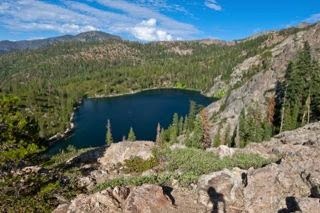 The THP area is adjacent to Kangaroo Lake which is a popular recreation area, and within a few miles of the Pacific Crest Trail. Timber Products Company is planning a tractor based logging operation in ponderosa pine, sugar pine, incense cedar, Douglas fir and white fir forests. The THP area flows into the Scott River which is listed as impaired for temperature and sediment. 18 road drainage sites are planned for work including rocking, dip construction and culvert repair/replacement. There is a goshawk nest within .5 mi of the THP area in section 10. More information is available on the THP Tracking Center website.